In the same easy to understand and fun to experience style as Perspective Made Easy, Robbie Lee shows readers, step by step, the basic drawing skills they need to build a successful base on which to build any style of drawing expertise. 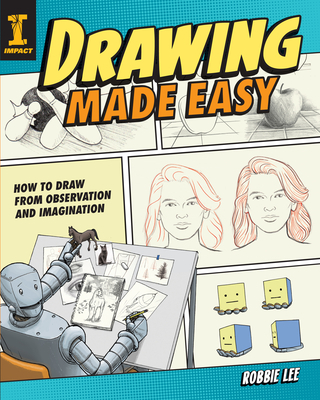 With a fun robot as their guide, readers will experience immediate success as they follow along with more than 20 step-by-step demonstrations and 30 lessons on topics such as the drawing process, perspective, drawing people, and drawing scenes. The book also broaches the differences in drawing methods: spontaneous drawing, drawing from observation, and drawing from your imagination. The simple language and graphic novel approach makes it all fun and easy.